Over the past year, the Ritz Crackers team has done some unique things with its carton packaging. 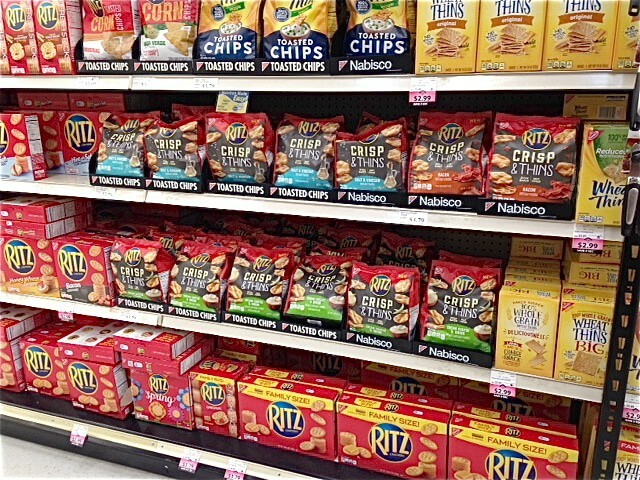 With a consistent use of branding and color, no one can dispute that Ritz has a strong shelf presence. But lately, there have been an increasing number of Ritz Crisp chips products appearing on shelf augmenting the product line and deviating from the standard carton format. Yes, the new products are now in flexible packaging. What makes this notable is that the Ritz team seems to have anticipated some of the negative issues with flexible packaging, in particular, stability on shelf. All too often you see products newly converted to pouches and bags that once on the shelf, fall over and lay in a disheveled mess – from a consumer standpoint, the worst possible way to present product. In this case, the bags of chips come prepackaged in a standardized tray system that has been sized to fit the specific bag configuration. The team has also utilized the trays as an additional branding communication opportunity to connect with the consumer. The trays are uniformly black, capitalizing on the black theme of the packaging, and contain the standardized Nabisco logo in the upper left corner – a simple block of copy identifying either the product style (Toasted Chips) or the word Nabisco. Consistent, bold, and clean – the trays bring order and stability to the shelf, reinforces the brand, and presents a shelf facing that is as reliable, impactful, and competitive as a wall of cartons. The package structure itself is nothing unusual (a gusseted footed bag) but the design is created to retain both the consistent strong Ritz brand logo and identifiable Ritz red background – using the Ritz red to cap and frame the face panel. For this “crisp” product format, the team inserted a strong dark band as a central unifying color that unifies the package and adds separation between the color bands at the bottom of the face panel that communicates the flavor variations of the package. These color bands are further identified and clarified by a strong bright color linked to the flavor variations. The product “crisp” (as opposed to a cracker) is featured as a graphic element interspersed with flavoring cues, but ironically the shape of the color field that communicates the flavor variation is reminiscent of the fluted Ritz Cracker. Perhaps it’s a subliminal recall to their flagship product? The icing on the communication cake (so to speak) is the addition of great photography that further communicates and reinforces the flavor variations. The rest of the elements on the face panel seal the deal – copy that uses typography and the simple secondary statement of Oven Baked – Not Fried (coupled with the images of the crisps) to reinforce the crisp and thin aspect of the product. The standard food facts and net content complete the package. All in all, a well thought out product expansion for Ritz – a flexible packaging presentation that stands out front and center on shelf. If you are thinking of transitioning to flexible packaging, contact us at 920-725-4848 or info@brand-directions.com. Throughout our 60 plus years in supporting customers with consumer brands large and small, we apply our experience and expertise to the entire process to create efficient and effective solutions. 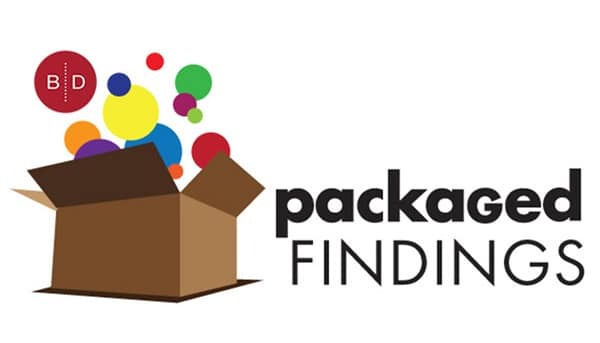 The purpose of our “findings” blog is to spotlight packaging that displays thinking that breaks the mold, delivers something new or chancy – or at the very least, highlight packaging that catches your eye in the retail environment.